Some factors to take into consideration when selecting commercial carpet include: the type of fiber and backings used, the construction of carpet (tiles or broadloom), and the manufacturer’s warranties. Classic Carpet & Flooring offers free on-site estimates and can show you all the different options. If your business has modular workspace stations (cubicles) we can utilize a patented lift system in conjunction with new carpet tiles which allows our installers to lift the cubicles without disrupting the employee’s space. This system saves you money by dramatically reducing disruption to your staff, and can eliminate the need to disconnect your phone / computer system. We can also schedule off-hours installation to further ease the installation process. 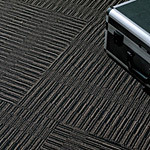 Commercial carpet is constructed of either nylon or olefin fibers. Olefin’s main advantages are its colorfastness and inexpensiveness. Nylon, on the other hand, stands up better to foot traffic and for most customers is a better value in the long run. Many businesses will find that carpet tiles are the perfect solution for their spaces. For starters, carpet tile can be installed without disrupting your business’ modular office space (cubicles), as they can be cut in to your spaces without disassembling your cubicles. Another advantage to using carpet tiles is that they can easily be removed and replaced if damage ever occurs to them in certain areas. As far as wear and care goes, carpet tiles are all warranted against edge ravel (long strings of running rows when a loop is pulled by traffic or by a vacuum cleaner) and they all have backings that prevent wicking (wicking occurs when liquid spills get underneath carpet and pool, only to later “wick” up the fiber like a sponge and reappear). Carpet tiles come in every variation, from basic colors intended for industrial uses to more designer variations, which use the most fashion-forward styles and colors. Some tiles come in patterns or are designed in specifically random patterns in order to break up any sort of monotony. The bottom line is that carpet tiles can add functionality, style and easy replace-ability without destroying your flooring budget’s bottom line. Have your decorator consultant explain how carpet tiles can work as an advantage to your work space. Moisture-resistant barrier eliminates reoccurring stains (by inhibiting spills from penetrating into the backing). Guarantees against delamination (the separation of the primary and secondary backings – usually manifesting in bubbles and ripples). Anti-microbial treatments minimize mold growth. Warranties against seam edge ravel and zippering. Warranties against pilling and fuzzing. We offer carpets with the Shaw EcoWorx backing. It is a sustainable alternative to the traditional PVC that is superior in durability and value. Ecoworx also contains 40% recycled content. Backed by the industry’s only environmental guarantee for carpet backing—at the end of its useful life, Shaw Industries will pick up your EcoWorx (at no additional cost) so it can keep on working. What that means is your carpet tile doesn’t end up in a landfill—it gets cycled back into the manufacturing process to make more EcoWorx, again and again.